Bouncy Castle Slide - Dance & Bounce Combo! Dance & Bounce Combo! The name says it all! 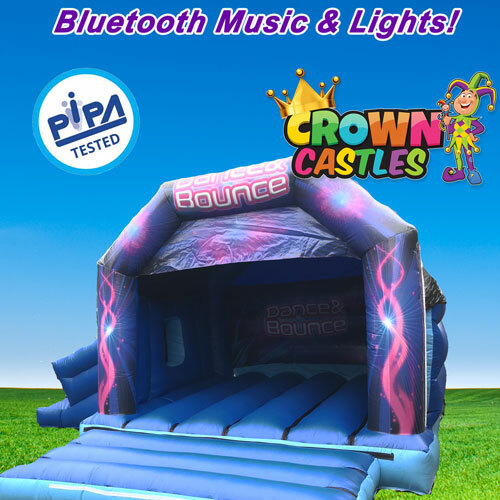 This amazing inflatable is a bouncy castle with a slide attached to the side & completed with a built-in speaker & light system. All the fun of a standard bouncy castle Slide but now with a music system so the whole family can enjoy their favourite songs. Bluetooth enabled speaker system - A smartphone, tablet or Bluetooth enabled device is required. Our combo Bouncy Castle slide is one of our most popular choices so book early to avoid disappointment. Please always check the size of your venue to ensure your chosen inflatable will fit, always adding an extra of 5 foot to all sides of the inflatable for safe operation. If you are unsure then you can contact us anytime.